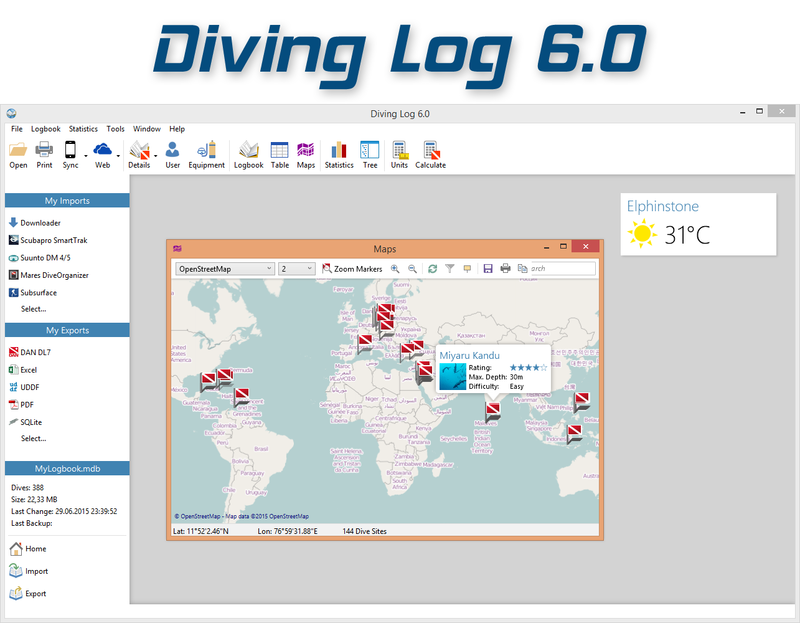 I’m happy to announce that Diving Log 6.0 is now officially available. If you have not installed it yet, please click here to download the latest installer. If you’re running the beta version, the automatic updater downloads automatically the final version. You can install it side by side to version 5.0 to try it out. You can also use your logbook file with both versions, as the format has not changed. I want to thank everyone who has tested the beta version – thank you for submitting feedback and reporting bugs! After 1.5 years of development and 10 weeks of beta testing I’m happy to get this version finally out for everyone. If you’ve bought version 5.0 on June 1st 2014 or later, you can update for free and receive automatically a version 6.0 unlock code. If you bought it earlier, you can update for 6.99 €. Some users (e.g. translators) can also update for free. Thank you very much for supporting and using Diving Log! This entry was posted on Wednesday, July 1st, 2015 at 7:27 pm and is filed under Diving Log 6.0. You can follow any responses to this entry through the RSS 2.0 feed. Both comments and pings are currently closed. I’m a little disappointed that the 6.0 upgrade is going to cost me, as I’ve been a user and supporter for around 4 years. I’d think that if anything you’d give your long-time users a break on the upgrade, not the new ones! I’m sorry to hear that you’re disappointed, I certainly appreciate your support! But I think it’s fairer if someone just bought Diving Log recently, that he get’s the update for free. Just imagine how disappointed someone would be who bought version 5.0 two month ago. This is common practice in software development that recent buyers get a free update within a certain time frame. I’ve tried to keep the update fee as low as possible and I think the price is low compared to other expenses in this sport (equipment, costs per dive, etc.). We’re talking about 2 or 3 soft drinks. Thank you for your understanding! Sven, you are right. I’m willing to pay the fairly trivial amount to upgrade, and you deserve it for the fine software you have created. I take back what I said.